W. Samuel Patten never set out to deceive the American people or give foreign power brokers unfair influence over U.S. politics, his attorney said. Instead, the Maine native who once wrote for a weekly newspaper on the coast was committed to making lives better in countries in turmoil, and was just a little too loyal to overseas clients who he believed shared his ideals. 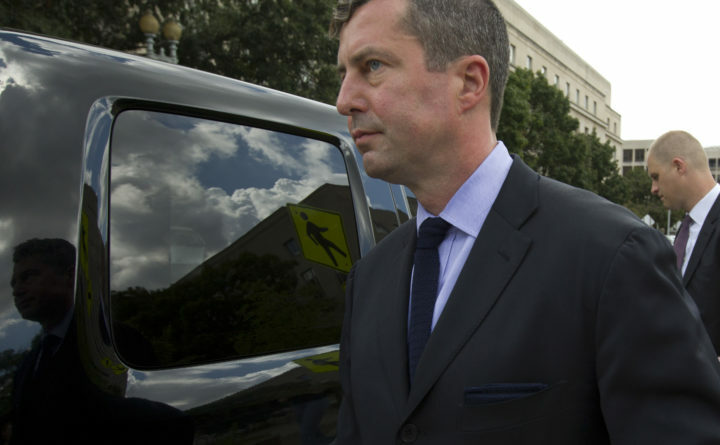 Patten pleaded guilty to funneling $50,000 in illegal foreign donations from a pro-Russia Ukrainian politician to President Donald Trump’s inaugural committee. But Patten himself didn’t even like Trump, his attorney wrote. 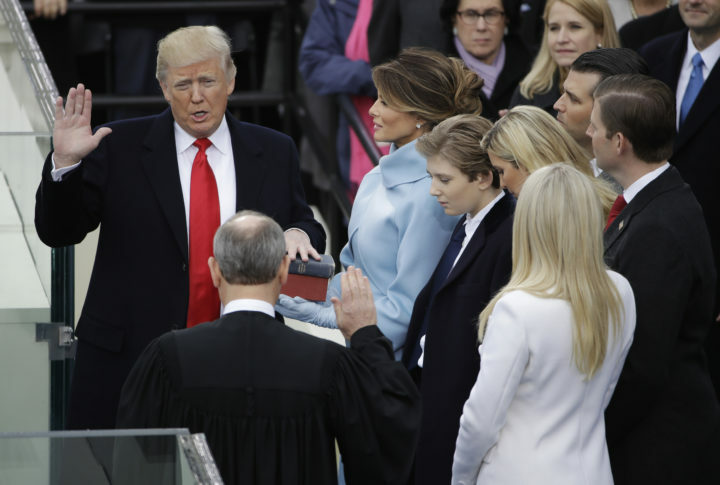 In this Friday, Jan. 20, 2017, file photo, Donald Trump is sworn in as the 45th president of the United States by Chief Justice John Roberts as Melania Trump looks on during the 58th Presidential Inauguration at the U.S. Capitol in Washington. Sears’ memorandum, while casting his client’s actions in as positive a light as possible, tells the story of Patten’s nearly three decades climbing a ladder of political influence. Sears wrote that Patten networked through Maine politicians and worked up through increasingly influential — and sometimes dangerous — jobs promoting American-friendly policies and candidates overseas. It was a 25-year run that eventually placed him in the intersection between a powerful foreigner and the incoming U.S. president. Patten, 47, was sentenced Friday to three years of probation, 500 hours of community service and fined $5,000. While the charge of failing to register as a foreign lobbyist can carry a sentence of up to five years in prison, Judge Amy Berman Jackson was swayed to be lenient, in part, because Patten became a willing source for prosecutors in other ongoing, undisclosed investigations, the Washington Post reported. Prosecutors disagreed that he didn’t have an agenda to influence the American people or politics. In a statement of offense filed in August, Assistant U.S. Attorney Michael DiLorenzo wrote that Patten broke the law by contacting “members of the United States legislative and executive branches as well as the media” to promote his clients’ agendas without identifying himself as a foreign agent. Patten wrote talking points for his pro-Russia Ukrainian clients as they carried out meetings he’d arranged for them on Capitol Hill in order to promote their interests “and influence United States policy,” DiLorenzo wrote. The Maine native also helped his clients write commentaries that appeared in U.S. newspapers, the prosecutor wrote. Patten was one 41 people charged, directly or indirectly, as a result of special counsel Robert Mueller’s investigation into Russian interference into the 2016 election. Mueller’s full report has been completed, but not released to the public. Trump’s attorney general, William Barr, said that although he thinks “ spying did occur” on the presidential campaign, the Mueller report did not find that Trump conspired with Russians. Patten’s central role in what his attorney called “one of the largest and most high-profile investigations in our country’s history” is a big leap from his roots in Camden, where he graduated from high school in 1989 and spent about a year after college writing for his father’s weekly newspaper, the Camden Herald. But he said Patten came from a wealthy family — his grandmother was Washington socialite Susan Mary Alsop and his grandfather was British politician Duff Cooper — and that created opportunities. 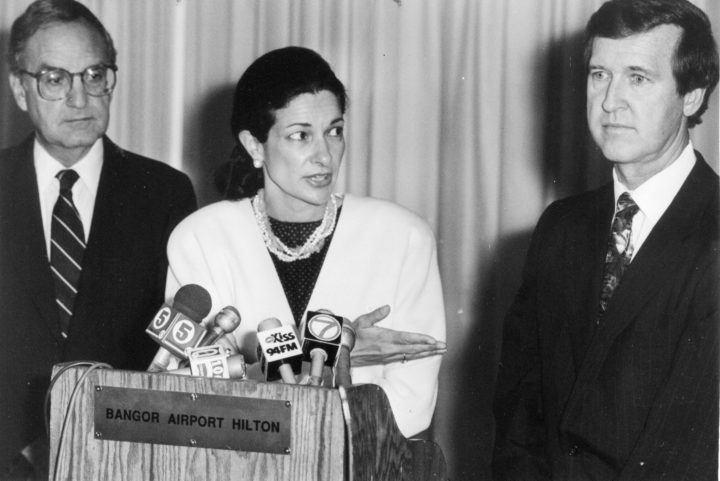 Then-U.S. Rep. Olympia Snowe is pictured with U.S. Sens. George Mitchell (left) and William Cohen in Bangor in 1991. Samuel Patten interned as a college student for Cohen before graduating from Georgetown University in 1993 and would later work as a speechwriter for Snowe. While at Georgetown University in the early 1990s, he interned for then-U.S. Sen. William Cohen, R-Maine, among others, and, after his stint at the newspaper, worked on Collins’ unsuccessful gubernatorial campaign in 1994. He returned to work for Collins in 1996, when she successfully ran to replace Cohen in the Senate, and again in 1999. But in the intervening years Patten lived and worked in Kazakhstan, as he told Hufnagel he would, first as a teacher, then moving into government relations work for international companies, Sears wrote. “It was in Kazakhstan that Mr. Patten met his first wife, Aizhan, learned basic Russian, and fathered his only child,” Sears wrote. Patten’s friends and supporters told the court he was so committed to what he considered American ideals of fairness and democracy that he willingly went into harm’s way to promote them. But the political network he’d started to build at Georgetown called him back to Maine. After a short return to Collins’ staff, the senator recommended him to coordinate George W. Bush’s presidential campaign in the state in 2000. He followed his work with Collins and Bush with a series of jobs with the pro-democracy nonprofit International Republican Institute, in Russia, Kazakhstan and — just as the country was lurching toward post-Saddam Hussein elections in 2005 — Iraq. “[W]e were under constant threat in Iraq. Our lives were at risk on a daily basis, car bombs, suicide vests and snipers,” Patten’s friend and colleague, Ahmed Al-Nagr, wrote to the court ahead of his sentencing. “You get to know people much better and their true colors show in a war environment. 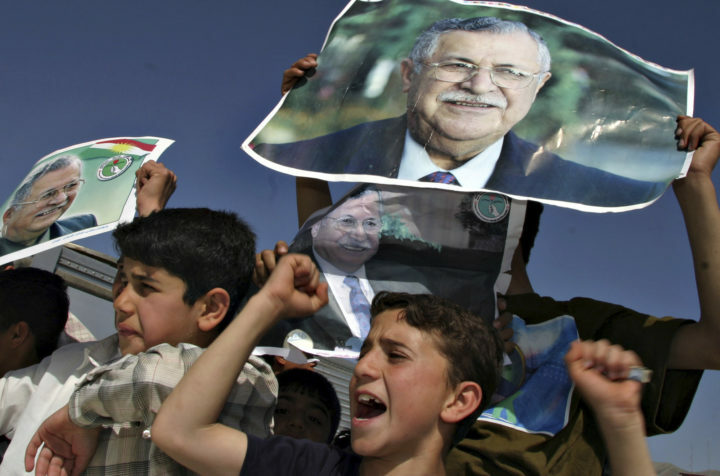 In this April 6, 2005 file photo, Kurdish youngsters celebrate the election of then Iraqi President Jalal Talabani, in downtown Sulaimaniyah, Iraq. Talabani was named the president by the Iraqi National Assembly put in place by voters earlier that year. He returned to Washington after the 2005 elections in Iraq and took up political consulting before his Maine ties seemed to open another door. Patten worked as a speechwriter for then-U.S. Sen. Olympia Snowe, R-Maine, before returning to Bush’s team in 2008, this time as a senior advisor for Under Secretary of State Paula Dobriansky, according to Sears. After Barack Obama was elected president and Bush left the White House, Patten went back into political consulting and bounced around between jobs promoting human rights and democracy in Eastern Europe and Central Asia, Sears wrote. Sears wrote that all along, Patten worked for ideals, not money, turning down big paydays for jobs he didn’t believe in — such a gig for an anti-NATO client in Montenegro and others for “European nationalist-populist parties” — while volunteering for jobs he did. Patten bucked his party by offering to campaign for Lee Busby, a write-in U.S. Senate candidate in Alabama, to try and block controversial Republican Roy Moore from winning a 2017 special election there, Sears wrote. In 2014, Patten reunited with former International Republican Institute co-worker Konstantin Kilimnik — who has citizenship in Russia and the Ukraine — to form a political consultancy focused on the Ukraine. This is where Patten’s network, which had served him well in terms of professional advancement over the years, seemed to put him on a collision course with Robert Mueller, the former FBI director who would go on to investigate allegations of Russian interference in the 2016 election. 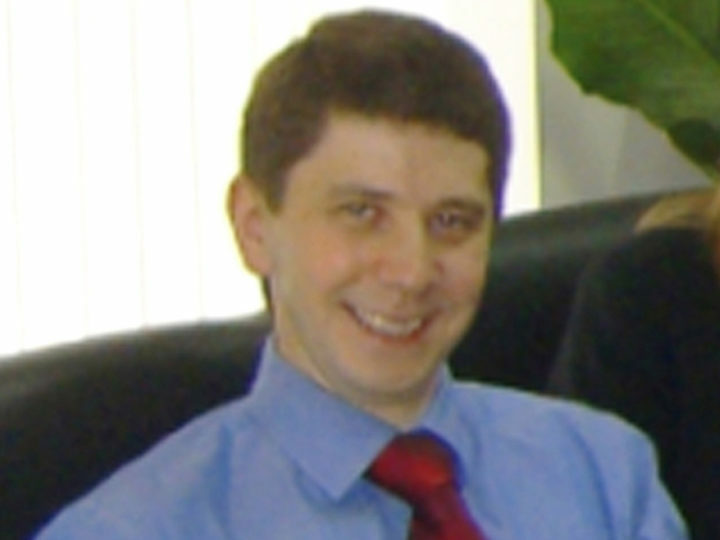 The Washington Post described Kilimnik as a longtime associate of former Trump campaign chairman Paul Manafort, who last month was sentenced to prison for more than seven years for a slate of charges including obstruction of justice and witness tampering. Kilimnik was charged with obstruction of justice last June, and prosecutors reportedly believe he has ties to Russian intelligence, a claim Kilimnik has denied and Patten has said he knew nothing about. Patten told prosecutors that while working with Kilimnik, he helped a pro-Russia Ukrainian politician — a client identified in court documents as Foreigner B — pass $50,000 to the Trump committee through a “straw man” American donor in exchange for four tickets to Trump’s inauguration. In the aftermath, he acknowledged to the Senate Intelligence Committee that he downplayed his contact with U.S. officials on behalf of foreign clients and deleted 200,000 emails, his attorney said. But he at least partially redeemed himself, voluntarily provided investigators materials that incriminated him, including over 1,300 pages of documents, Sears wrote. The judge who sentenced him Friday agreed, at least enough to let Patten stay out of prison.